Unlike a beautiful piece of art hanging in a gallery, a website has to be more than a pretty face. There is no question that everyone loves a beautiful website. Design matters. We want our websites to look pretty. We see other pretty looking websites and we get "design envy". We want to make ours look just as pretty. The question is, do these beautiful websites help generate and increase sales? Do they help businesses achieve their online goals? The truth of the matter is that many pretty websites fail to deliver any kind of results. 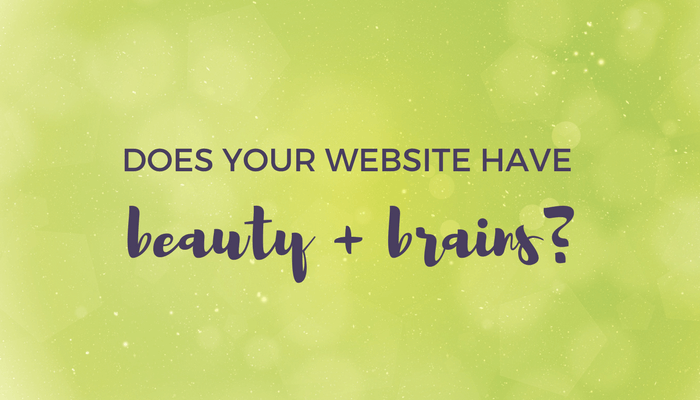 A gorgeous website is not going to be the deciding factor on whether someone hires you or buys your products. That's where the brains come in. Think about what your visitors want to do and make it easy. Are your website visitors taking action? That is where the results come in. The strategy is what will produce a website that makes money. One that produces leads, sales and conversions. A website that produces results. A beautiful website that lacks the right content, user-experience or call-to-action is basically beauty without brains. A beautiful website captures just one tiny part of the equation. I’m tired of websites that are merely creating "pretty pictures" online, and don't actually help you rake in more e-mail sign-ups, more product purchases, or more contact requests. So, which is more important? Beauty or brains? The answer is: both! You want a site that both looks good and is effective.